LoVArts’ mantra of connection and collaboration was put into practice last night at the December networking meeting held at the wonderful South Kilburn Studios. The line-up of guest speakers was fantastic, truly demonstrating the beneficial nature of sharing ideas and experiences among emerging visual artists, established professional artists, and individuals and organisations involved in galleries, workshops and arts events. First to share his experience and provide advice on how to achieve success was London based visual artist Adam Ball. His talk was truly inspirational, and his key message was above all to ‘be ambitious’. Ball described to his audience how after graduating, he wanted to cause a stir and get himself noticed, and so set to work planning the installation of a ten metre high painting in London’s Golden Square in Soho. Taking more time and costing more money than he imagined, with more obstacles in his path than he envisaged, Ball’s drive and determination led to his success in exhibiting his painting and catching the media’s attention. As an emerging and aspiring visual artist at the beginning of his career, this was exactly what he wanted to achieve. The installation appeared on the front page of the Independent newspaper, and from these beginnings Adam Ball continued creating his art. He has since exhibited his works internationally, including Goss-Michael Foundation, Dallas; Paul Kasmin Gallery and Gogosian Gallery New York; Centre of Contemporary Art, Bahrain; and in Paris, Madrid, London, and Glasgow. His talk was inspirational and uplifting, from the point of view of an artist who understands how daunting the art world can be and how impenetrable it can seem to those wanting to break in. Ball encouraged his audience of aspiring artists to become immersed in art by seeing exhibitions, visiting galleries, and finding inspiration everywhere, whilst entering competitions, contacting galleries, and maintaining a professional and up to date website. Most importantly for success, Adam believes, is self-belief, retaining your integrity as an artist passionate about your own work and ideas, and of course his key ingredient – ambition. Next up to address the meeting was the lovely Dalia Zermon, founder of Paint Jam London. The organisation describes itself as ‘the studio for everyone’ – inclusive, experimental and welcoming, this is art to share, express oneself with and delight in. Paint Jam runs regular workshops and events which are welcome to all, believing in the therapeutic and beneficial power of art and the creative process. The Social-Art-Studio which provides materials and space for those wishing to explore their creative side is wonderfully unique in that it can be set up anywhere, from public events, corporate and community events, and private parties. The wonderful welcoming atmosphere of Paint Jam was expressed through Dalia’s talk to the LoVArts meeting, highlighting the organisation’s positive approach to making art accessible and possible for everyone. Paint Jam’s engagement with charities and the support it provides for community activities is also admirable. Art here is a powerful force for fun, enjoyment and positivity. 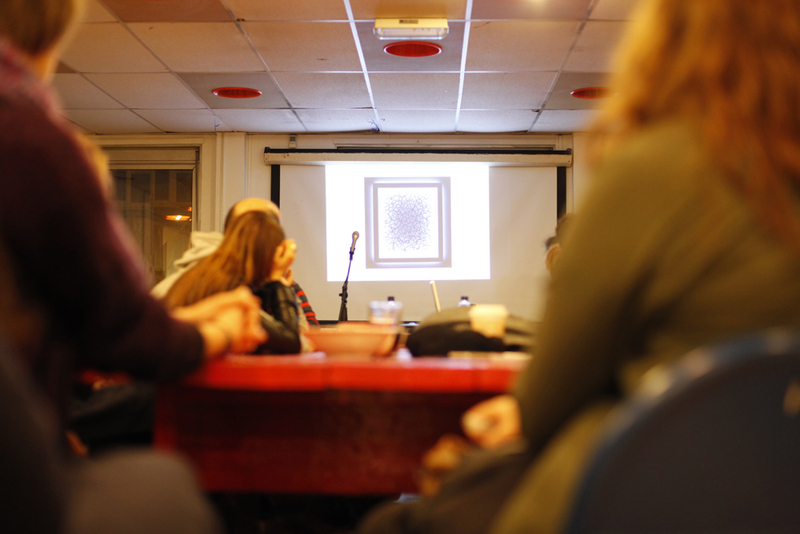 Nimrod Vardi & Hajni Semsei, Founders of the Arbeit studios and work space, and the Arebyte Gallery, spoke about their experience setting up their business and the studio space in Hackney Wick. Hackney is now said to be the home of the greatest concentration of artists in London, a creative population in which the Arbeit nestles nicely. Nimrod and Hajini bought the old Hackney wick warehouse when it was a vast uninhabitable space, but their vision of a creative space which artists could make use of was realised through hard work and collaboration. Wonderfully, the electrician who helped wire the building was a practicing photographer, and worked on the warehouse in exchange for an exhibition of his photographs. It is this kind of exchange of skills which warrants the term ‘artistic community’. Arbeit provides studio space for rent and with the profits made also runs the gallery Arebyte, which exhibits a range of works from performance art, sculpture and visual art. Nimrod and Hajini emphasised how important it is that they have embraced their work and progress as an opportunity to learn, conscious that it is always a process. Support from artists and the community of Hackney Wick have been invaluable to them, and their space is a productive and inspiring environment. What was brilliant about the LoVArts networking meeting was the range of speakers, skills and experiences which were shared yesterday evening. The venue, South Kilburn Studios, is a hub for creative businesses, professionals and events, and is also the current base for Paint Jam London. LoVArts’ cofounder Aleksandra Karpowicz thanked the speakers for attending and shared her excitement for the future of LoVArts, which includes more events and the upcoming exhibition ‘Infinite London’ in 2014. As the audience and collaborators of LoVArts continues to grow, the future looks very promising indeed. This entry was posted in Networking and tagged Art, artists, London, london visual arts, London Visual Arts - LoVArts, londonvisualarts, LoVArts, meeting, networking, south kilburn studios, talks. Bookmark the permalink.